London-based Country/Americana foursome The Wandering Hearts might be a foreign name to you, but if you listen to the radio there's a chance you might have heard one of their tracks before. With lots of play on BBC Radio 2 and an interview on Bob Harris' Country Show among lots of publicity they've done, their debut album Wild Silence is out today. The album starts as it means to go on, joyously upbeat and containing lots of captivating melodies. 'Devil' is a definite stand out track, with a quiet guitar strum accompanying the opening chords, drawing you in like a great offer you can't resist. Then it picks up into one of my current favourite tracks, which would be perfect on a driving playlist as its optimistic beat would be the perfect track to groove to on a long journey. 'If I Fall' slows the tempo a little, just to break it up a bit. If you thought that meant complacency, you would indeed be wrong. Record of The Day said of the band that they have "some of the best harmonies you'll have heard in years", and this song definitely promotes that, as they're seamless and make for spine-tingling listening. 'Rattle' is a percussion-soaked tune with a definite Country element, with an unexpected deep-voice bridge building up to a very bouncy crescendo in the chorus that continues until the next one. Think Sheppard's 'Geranimo' but with more guitar. 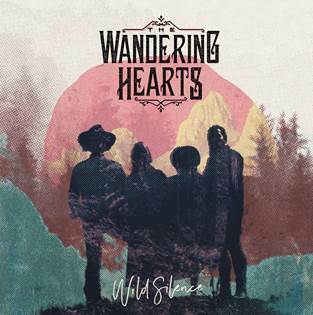 It took The Wandering Hearts 26 minutes to be discovered after putting their first ever demo on SoundCloud, and it's no wonder really - Wild Silence is an amazing exhibition of what they can do. Don't be surprised if you see them playing on the radio or touring in countries around the world. It also might make a few appearances in my monthly playlists. Buy or listen to Wild Silence on iTunes, Spotify or Apple Music. Follow The Wandering Hearts on Twitter, Facebook, Instagram or visit their website to see what they're up to. Oooh I've never heard of this band, but I love finding new music to listen to! I’ve neber heard of these but I always trust your taste in music.. as soon as I’ve got a minute I’m searching these!